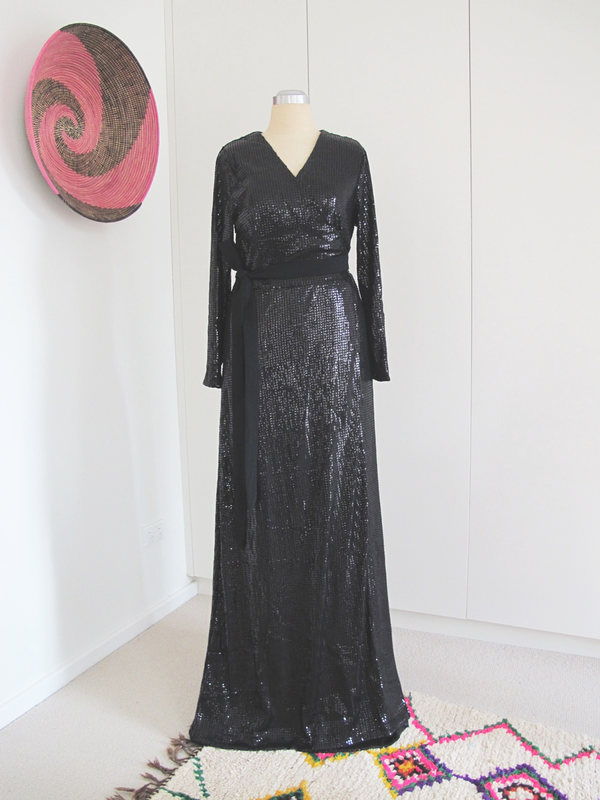 Last week mum and I worked on making this long wrap black sequinned gown for a black tie event for the weekend. The dress is based on Kwiksew sewing pattern K3489 and is made using a fabulous sequinned black jersey fabric from Spotlight. I had seen this Diane von Furstenberg dress and knew it was just the right gown for the event. Especially since it has been -8 celsius overnight around these parts. I could wear a thermal underneath too, yay! The gown was longer and with a different hemline to the original sewing pattern and the belt is wider and longer and wraps through the side seam of the gown. These were two simple changes we made to the sewing pattern version as otherwise it was perfect (the less seams the better, we thought). It's hard to make a properly fitted dress unless you have someone to tailor it on you or you have a dress making doll that is exactly your proportions. My dress making doll was my mother's, and she's a little shorter than me. You can see the waist seam is too low on her in the photos above. I really enjoyed working on it with my mum. It was a great bonding experience and we were equally happy with the outcome - which is important in my family! As a teenager, I was a bit prone to charging through a sewing project and hoping for the best. Since then I've learned you need to take an approach more like a carpenter - measure twice, cut once. In the case of sewing a dress, it is: measure, cut, test, sew, check, repeat. 1. Remove the stress. Have a back-up outfit. Buy extra fabric. Use a fabric type you've worked with before. Avoid super expensive fabric. Shop the sales, hoard just a little bit. The fabric we found was $4.50 a meter reduced from $49.95! 2. Make a practice version for fitting purposes. I cut and basted together a practice version of the bodice from a cheaper scrap of fabric I already had. This way I knew what size to cut and that the final dress would fit. 3. Be clever about the style of dress. 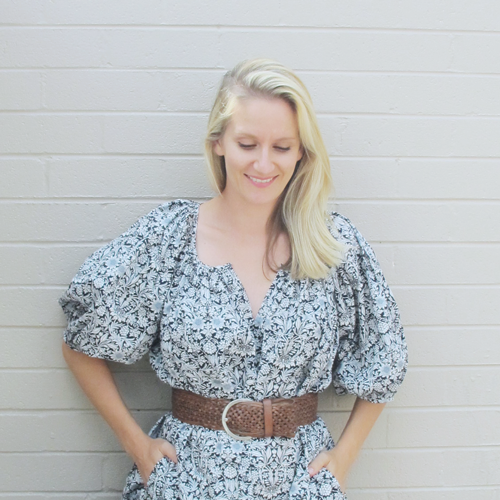 This dress had no zippers or buttons which made it a lot easier and quicker to make. There is nothing like feeling tired and near the end of your sewing project only to have to undertake one of the most complicated and crucial steps such as sewing in a zipper or button-hole. It can be a recipe for tears at 1 o'clock in the morning. 4. The making process is still going to be harder than you wanted it to be so choose to make something you can wear again. 5. You need good quality fabric scissors and a good sewing machine. It is impossible to make a beautiful garment if your scissors and sewing machine are not up to scratch. We used my mother's industrial sewing machine as my own struggled a little getting through the layers of sequins.